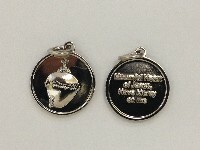 Medal: Mournful Heart of Jesus Medal (Silvertone/Shiny) Pack of 5 with SPANISH prayer card. The front of the medal shows the image of the Mournful Heart of Jesus with an inscription on the back of the medal which reads IN ENGLISH "Mournful Heart of Jesus Have Mercy On Me." Comes with prayer card in SPANISH. Jesus 8/9/2013: "...The one who wears this medal will not forget to offer small sacrifices to this Mournful Heart of Mine." 2. "Those devoted to my Mournful Heart, if persecuted by the abuse of authority, will be given the grace of perseverance in righteousness." 3. Those devoted to My Mournful Heart will be granted remarkable favors through the intercession of My Mother's Immaculate Heart, for She is most thankful to those who seek to console Her Son." Image in photo may appear darker than actual item due to reflection.